There is nothing quite so mesmerizing and astounding as standing amongst ancient ruins and experiencing a place where mankind changed the course of history over two thousand millennia ago. 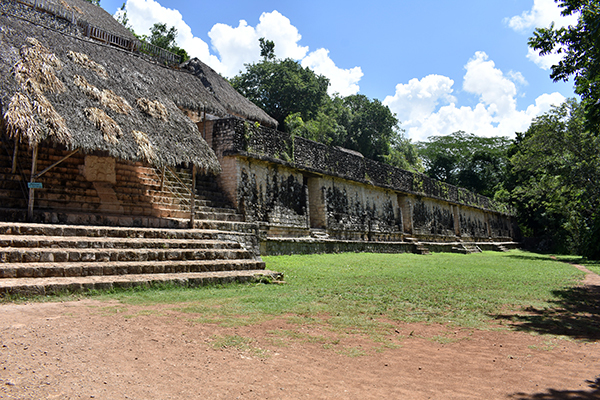 Ek Balam is just one of the many ruins that can be found throughout the Yucatán Peninsula. A lesser known fact is that Mayan ruins are actually not singularly located in Central America and into South America, but in North America as well. All are equally extraordinary. 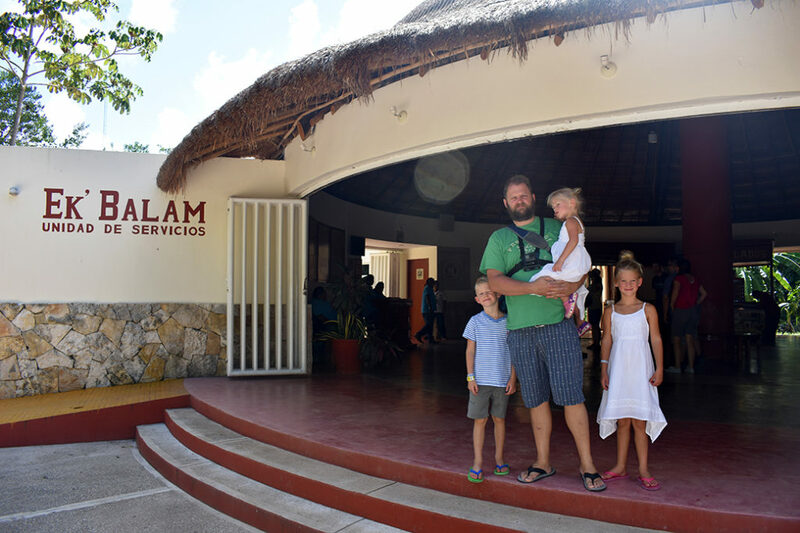 During our trip to Mexico we toured not only Ek Balam but Tulum, Chichen Itza, and Coba to view a glimpse into Mayan civilization long remembered and never forgotten. Ek Balam translated means Black Jaguar. The Mayans believed that the jaguar represented the afterlife. The architecture, the jungle, the temples – they all reflect an integral belief system that what is above is connected to what is below. Thus why Ek Balam is so named. 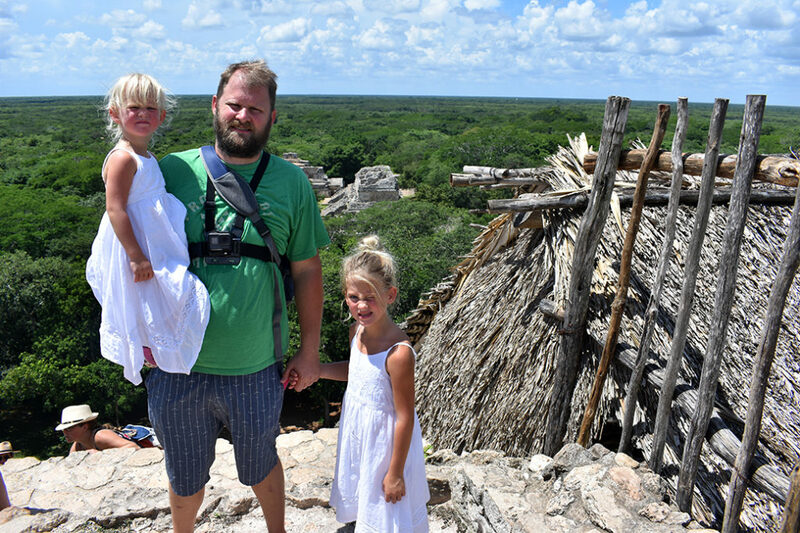 Though Ek Balam is one of the more prestigious sites and one of the only Mayan temples that you can still climb, it remains less popular. During our tour we enjoyed very few crowds and were able to take our time roaming about the ruins. 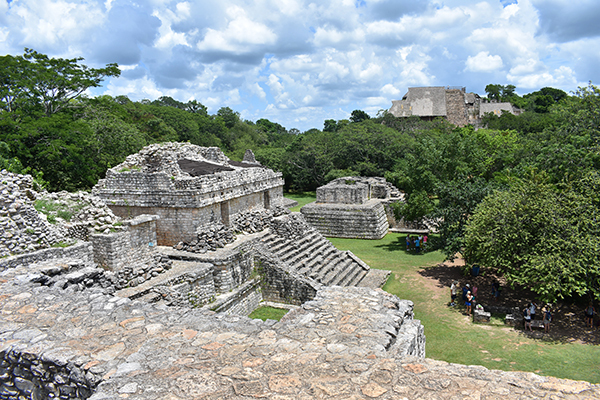 The city of Ek Balam thrived from 600 BC into 1600 AD, even longer than Chichen Itza, and was believed to be an elite city and one that was reserved for the very rich. 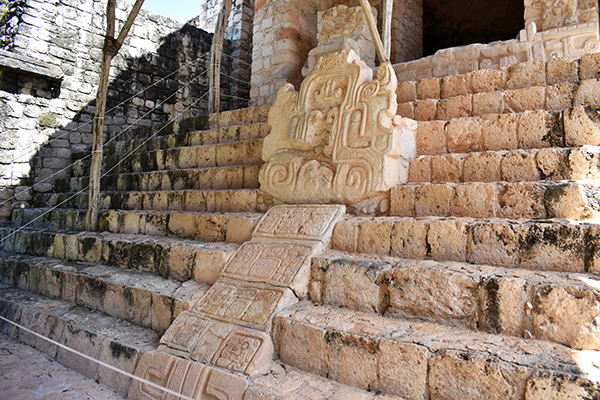 The most notable time period for Ek Balam is said to have been during the years of 700 BC to 900 AD. 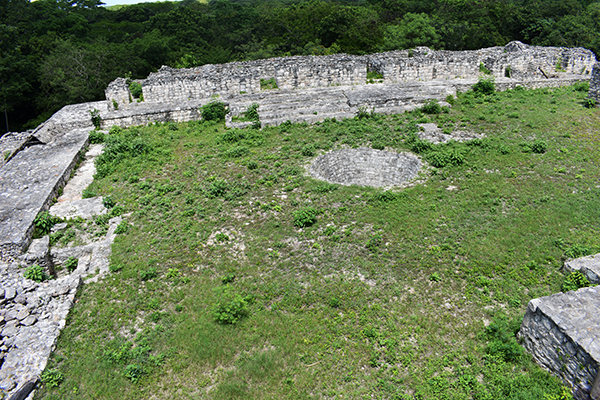 Like all Mayan fortifications, this was a 20 foot walled city and emcompasses 5 square miles / 15 kilometers. 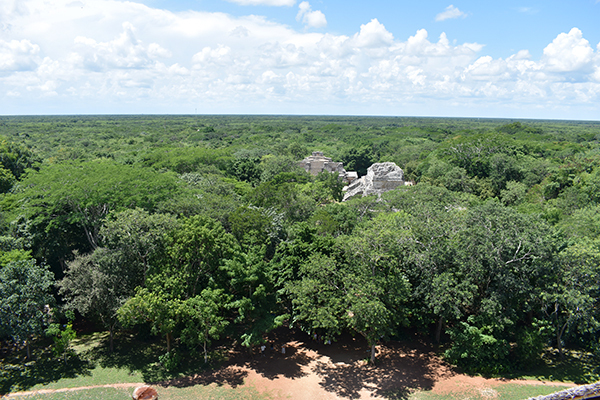 In fact, there is much of Ek Balam that hasn’t even been unearthed yet as the immense jungle took over once the city was abandoned, and consequently much we don’t know. We do know that there is a baptismal font situated directly in front of the Acropolis. In the book Yucatan Before and After the Conquest we learn more regarding the purposes of these structures throughout the Mayan Civilization which included rituals of full immersion, fasting and the naming of children. 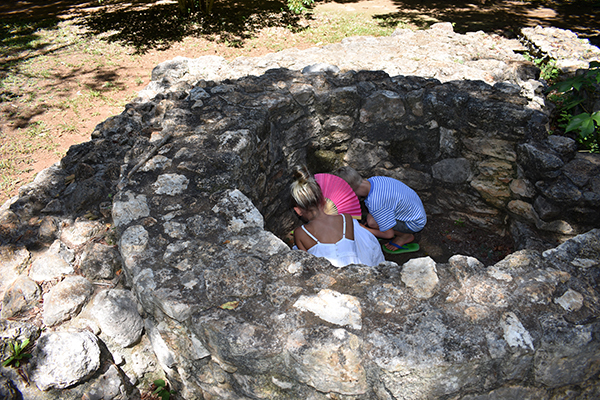 We also know there is a very advanced rainwater collection well visible from the Acropolis, as the nearest cenote is over a kilometer away. 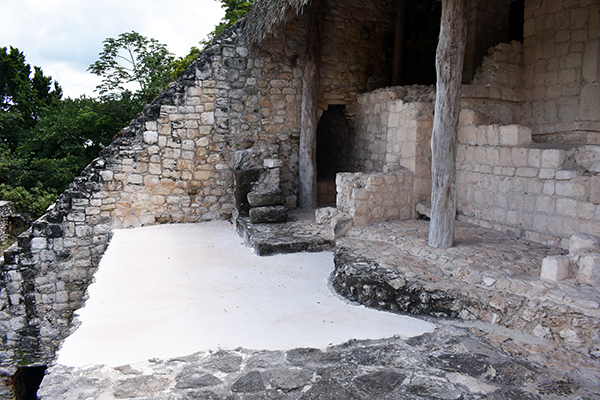 The Acropolis is Ek Balam’s temple. 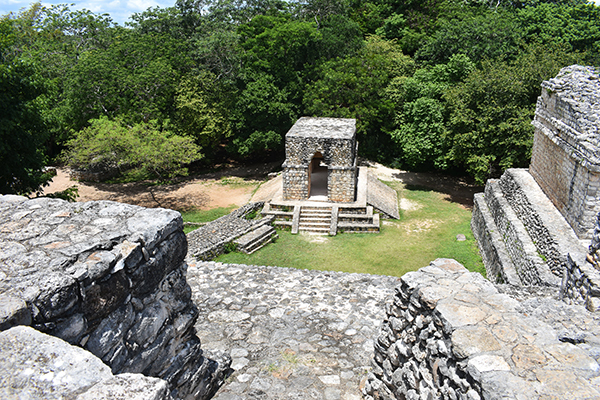 It is also known as the Balam Tower and is the tallest structure at Ek Balam and is composed of six distinct levels. The staircase to the top has 106 steps and is 96 feet tall with the well recognized and distinctive temple room at the top. The main floor branches out horizontally and has chamber windows that reach the far interior. Not much is known about the inner sanctum as this site has only begun to be explored, but we do know that mid way to the ascent of the Acropolis is a doorway. This doorway is framed by the teeth of a jaguar. When the ruins first began to be excavated a red jaguar with jeweled eyes was found behind the doorway. It was ultimately discovered that this room leads to the Royal Tomb of Ukit Kan Le’k Tok’. At the tomb, engraved along the doorway wall reads the inscription Gateway to Hell. Here we find the notorious sacrificial pit, nearly 60 feet deep with sharp jagged spikes lining the floor. It is a steep climb to the top of the Acropolis, especially so when you are seven months pregnant, have a toddler who won’t climb, a daughter who is afraid Dad will fall because he’s holding the toddler, and a son who doesn’t want to keep going after he makes it up halfway. But we did it! And it was amazing. The views from the top of the temple show how incredibly dense the jungle is. You can see where the ruins are located, but not yet excavated, by the mounds located throughout the peninsula. 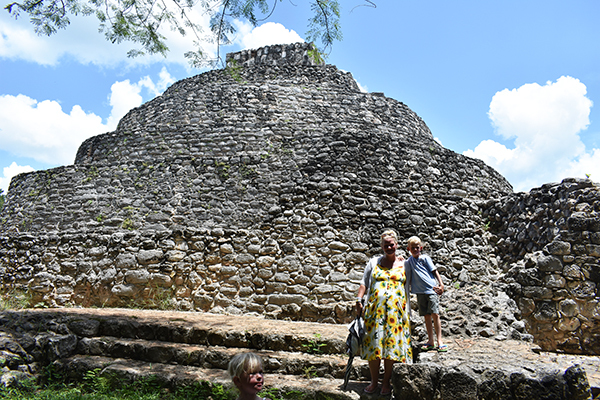 There is no end to interconnected cities, roads and temples at other sites throughout the Yucatán that made this area such a thriving metropolis. Additionally, this birds eye view gives a scope of why these temples were so revered. Standing at the top of the Acropolis you cannot mistake the sweeping feeling of being a world apart. 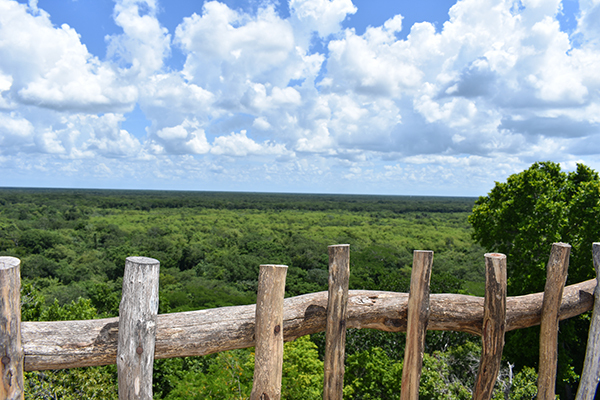 Naturally, being named Ek Balam, you can guess that Jaguars are dominant symbols of this ancient civilization, along with birds and snakes. The bird represents heaven; the snake represents the earth and the jaguar represents the afterlife. They are found etched into walls, framing entrances to buildings and temples, and serving as hieroglyphs. 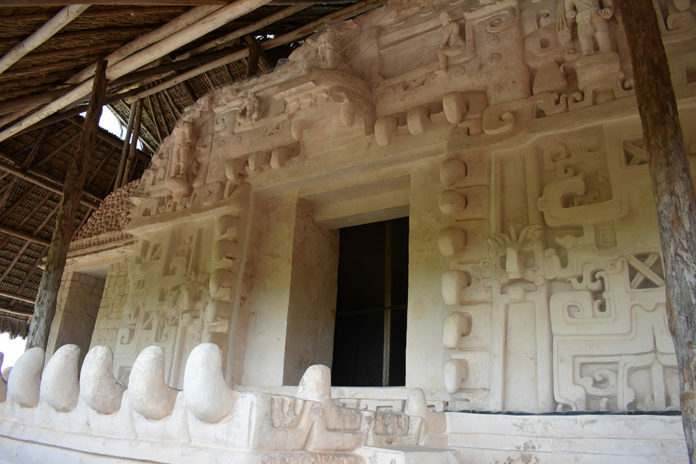 This belief system continues throughout not only this city, but all Mayan ruins. Symbolically, the jaguar represents the afterlife, but it is not the only way that the Mayans revered the life cycle. 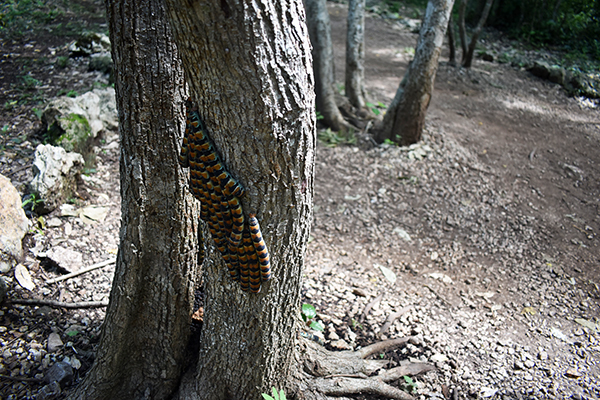 The Tree of Life was sacred to the Mayans and manifested itself in the Ceiba tree. A full life cycle is represented in each tree wherein the sun rotates around the tree and begins anew each day. These spectacular trees grow to a height of 90 feet and a diameter of 6 feet towering over the jungle and one can easily see how they served as a foundation for their civilization. The tops of the trees, the branches and the leaves are referred to as the crown. The base and girth of the tree is the trunk, and of course the root system of the tree spreads far and reaches throughout the city. Likewise, the crown of the tree represents heaven. The trunk of the tree represents earth, and the roots of the tree are symbolic of the afterlife. The earth and the fruit it produced was essential to their survival. The Mayans chose this land because of its warmth and fertile seasons producing year round agriculture offering them corn, beans, tomatoes, squash, avocados, cacao, and more. Touring the ruins of any one of these temples, it becomes clear that the belief system of the Mayans demonstrates that all life is intertwined. It also becomes clear how in tune the Mayans were with all the earth. ► For Kids: Our kids really loved exploring the ruins and peeking in all the open spaces and doorways to discover what lie behind them. 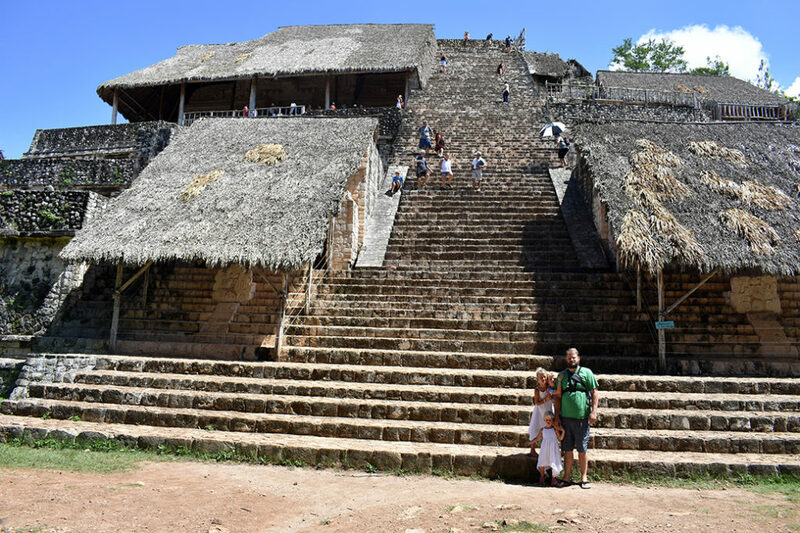 Our girls enjoyed the climb and the views, my son particularly enjoyed learning the history and culture of the Mayan peoples. They had so much fun running around unfettered. It was surreal to imagine that other children 3,000 years ago played on these same streets and climbed these same stairs. This place holds so many unique opportunities for world schooling. 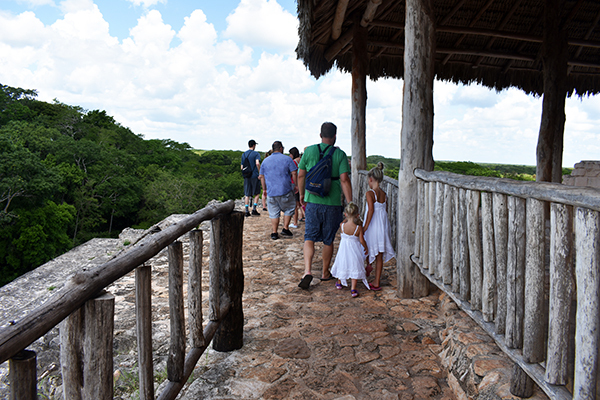 Have you visited the Yucatán Peninsula and toured any of the ruins? Which one is your favorite? We’d love to chat about it! 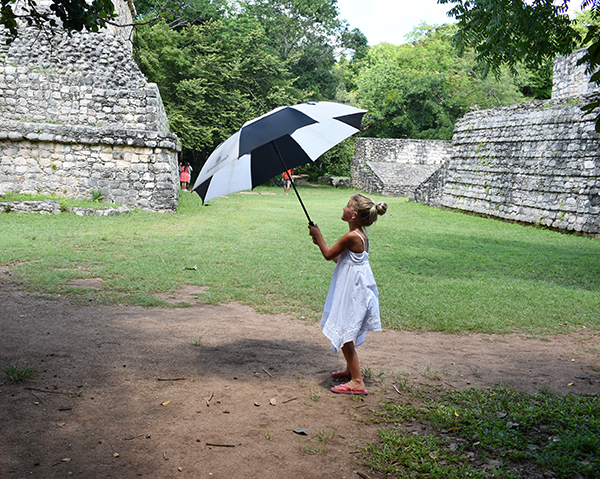 ► Nap-Time Version: Our family field trip touring ancient Mayan ruins and world schooling in the jungle at Ek Balam. 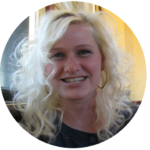 We hired Alma’s LDS Tours as our guide to tour the ruins and we learned so much during our exciting and historical filled day. This was our first stop for the day. 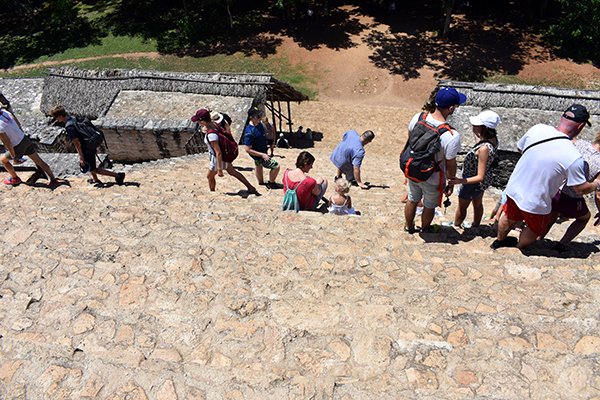 After Ek Balam, we toured Chichen Itza and the cenote Ik Kil.